The Routes of Santiago de Compostela in France represent several sites related to the pilgrimage to Santiago de Compostela. They comprise churches, bridges, hospitals and other wayside constructions along the four main and a number of subsidiary pilgrimage routes to Santiago. The Amiens Cathedral, a WHS in its own right, is also part of this Route in France. I wasn't aware of that when I visited. Thanks to Klaus Freisinger (see visitor reviews below) for pointing that out! My second visit to this elaborate WHS also involved a site inscribed twice: the city center of Bordeaux. Three of its medieval churches are on the Route to Compostela. We visited Saint-Seurin and St. Andre Cathedral. Especially the latter is one of the highlights of Bordeaux. 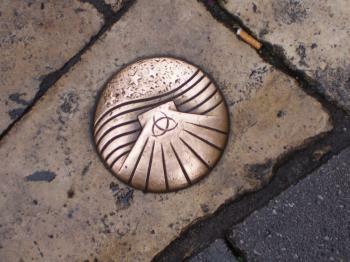 The Route is also widely displayed around Bordeaux, so I guess it receives numerous pilgrims although we didn't see any. After a third visit, I know think that I safely can tick this one off. This time I went to the Tower of Saint-Jacques in Paris. As this is the starting point for the routes across France, this is a major site among the 78. The richly decorated tower can be seen from afar, but there's nothing left of the 16th century church. The site is located a bit north of the Seine banks. Although it looks in pretty good shape, I was surprised to find no pilgrims here. There's also no way to get in. I just had to make do with a stroll around it, there's a small garden where you can sit and enjoy the view. 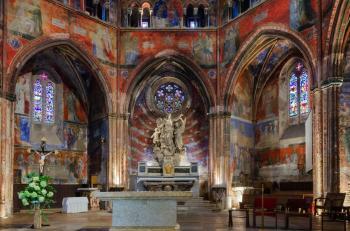 Basilica Saint Sernin in Toulouse was my 4th visit. An enormous building in a scruffy neighbourhood, surrounded by a cheap market on the Sunday morning that I visited it. I even had to search for the entrance, and found it at the churches highlight: the Porte Miegeville. I visited two properties that are part of this serial site in August of 2017 and three more in June of 2018. In an otherwise nondescript Rabastens, Notre-Dame-du-Bourg may end up as the first impression that is impossible to beat. The exterior is stately enough, but the interior is simply dazzling. Most vivid colorful frescoes, brilliant stained glass, every little detail is just impossible to take your eyes off. Some parts of the walls are in need of restoration; there was a local conservation worker examining those throughout my visit. The out-of-the-way nature of this church was underscored by the fact that the custodian and I were the only people inside the church for over half an hour. The place was definitely worth the time. My second target was in Toulouse, at the Basilique St-Sernin. It is among the biggest churches on the pilgrimage route. The intricate bell tower is one of the architectural highlights, but the interior of the basilica was somewhat underwhelming for my taste. It is impressive in a way any big church's interior is, but also sparsely decorated to the point of being on the bland side. The marble altar is undeniably beautiful and don't get me wrong, there are a few other fine features, sculptures, and paintings. The main entry is free, but access to ambulatory and the crypt requires a payment of €2.50. Overall, a worthwhile investment. The abbey church of St-Avit-Seineur has several fresco remains, but otherwise is a typical French village church: large enough to be impressive, with one or two fine features, but sparsely decorated in general. The abbey church of Notre-Dame-de-Nativite in Cadouin is just slightly more ornate than St-Avit, with a painted dome ceiling, a few brilliant stained glass windows, and fresco remains. What makes a visit here more fulfilling are the cloisters, with intricate decorations, animal-feature gargoyles, and a well-maintained garden. Extra fee for cloisters: €8. Cathedral St-Front in Perigueux is one of those churches that makes an immediate impression on approach, with a gorgeous ensemble of domes, towers, and spires. Inside, it is far from exuberant; chandeliers practically steal the show among the unadorned walls and columns; the huge wooden altar is very impressive (although badly lit when not used during a service); some stained glass windows as well. The cloisters here are barely worth the separate entry fee of €1.50 - they have a marginally unkempt look with no outstanding features. 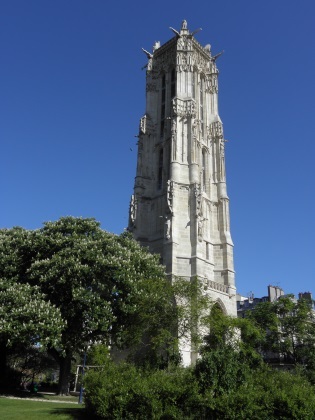 I also stopped by on many occasions by the Tour St-Jacques in the center of Paris, but never had time to go up top. I had already visited several parts of this WHS by car (some of which are inscribed twice). This year however I arrived in Bayonne by bus from Biarritz and since I had some time to spare before catching the next train to St Jean Pied de Port, I decided to wander about and explore Bayonne first. Although I was going to start my pilgrimage to Santiago from St Jean, I asked for some info at the pilgrims' welcome desk inside the cathedral and since I quite liked the cathedral and the warm welcome I received, I also decided to stamp my credencial for the first time here. However, although I wore the pilgrim shell on my backpack and although there were quite a few other pilgrims passing by, no local greeted me with a "Bon Chemin" as was the case in practically all the other villages, towns and cities I had visited in the previous years. My gut feeling is that nowadays the route of Santiago de Compostela in France is no longer "alive" amongst the locals. Some if not most aren't even aware that a given town or village is right on the camino/chemin. It's as if it is merely a tourist label to attract tourists. Yet it is not why most tourists visit so it's not given much importance. The only exception to this is of course St Jean Pied de Port which lies at the base of the Roncevaux Pass across the Pyrenees. The routes from Paris, Vézelay and Le Puy-en-Velay meet at St Jean Pied de Port and it is the pilgrims' last stop before the arduous mountain crossing. Nowadays, it is mostly visited by pilgrims who start their pilgrimage from here. Numbers are steadily increasing and from April to November, when the pass is open, you will most definitely have more pilgrims roaming about than locals. From a quick glance at the statistics in the pilgrims' welcome office, numbers have really soared from a couple of hundreds visiting St Jean in 1996 to several thousands in 2015. According to their statistics, pilgrims who start their camino in St Jean are mostly French, followed by Americans, Spaniards, Italians, German, Koreans, Dutch and Brazilians. This was more or less reflected in the camino as those nationalities were pretty much always present in every other albergue, monastery or cathedral. The main highlight of St Jean are the fortifications and of course the Porte de St Jacques which marks the first step of an 800km journey to Santiago de Compostela for so many pilgrims. 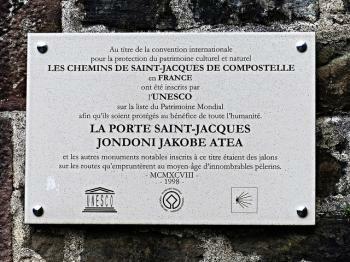 There you can find the Unesco plaque (picture) too. Since the first 23km are uphill all the way except for a sharp descent to Roncesvalles, I decided to stop at the only refuge half way up and take it easy. It really turned out to be a wise decision as upon arrival in Roncesvalles the day after, other pilgrims I had met told me that it had rained the whole afternoon and morning, so not only did I luckily avoid the wet weather but most importantly I suffered no serious injuries along the way. Most pilgrims I met in the days to come and who had to stop because of an injury, all said that the first day of walking was quite a killer. The views of the mountains along this final part of the Route are fabulous especially at sunset/sunrise and towards the end of April not only the peaks were covered with snow but there were also some parts of the route which were still covered with snow (which became ice at temperatures close to 0 at daytime - something to keep in mind!). Unfortunately, although I also walked the final part of the Route in France and visited the main sites in previous years, I don't think that the route in France has any tangible OUV to claim more than other European countries I visited with different routes to Santiago such as Italy, Germany, Luxembourg, Netherlands, Brussels, Czech Republic, etc. 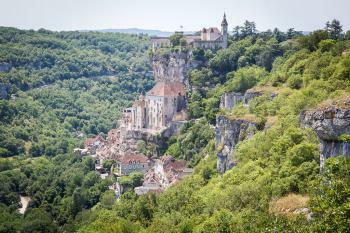 The Rocamadour site is fantastic and I'm a little surprised it hasn't been considered for its own listing. I had previously seen Asquins (when I went to Vézelay), Saint Sernin and the Hospital in Toulouse, Saint Guilhem le Désert, le Pont du Diable and Saint Gilles, all in addition to sites being already labelled as WHS on their own such as Amiens, Bourges, Mont St Michel and Paris (Tour Saint Jacques). But the big part was when I went on the way from Lyon to the south west of France during summer 2013. 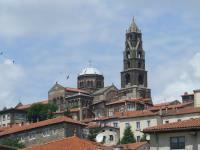 We started in Le Puy en Velay with its Hotel Dieu and above all, its magnificent cathedral. The cloister is especially awesome. We then went throughout the countryside to reach Saint Chely d’Aubrac, Espalion and Estaing, each village having a medieval bridge that was used by the pilgrims. The village of Estaing is really lovely. We stopped at a camping in Conques. The following day, we visited the medieval bridge in Conques and of course, the superb abbey, Sainte Foy, located in the historical village. The abbey is a fine example of Romanesque architecture and is especially famous for its sculpted portal. We then left for Figeac to see the Hotel Dieu, currently the town hospital. It is badly indicated and not promoted and we had to search for a long time before finding it. There is not a lot to see except the facades. Leaving Figeac and on the way to Cahors, we went through the small and lost village of Grealou hosting a Dolmen delimitating the way to Santiago. However, we did not manage to find it. 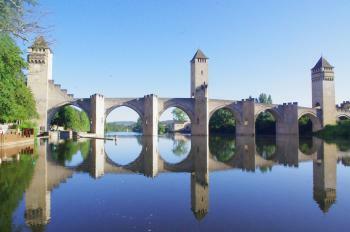 We arrived in Cahors, famous for its Catheral and above all of its fortified bridge, the Pont Valentré. Visiting and crossing this magnificent structure, we even manage to see a light spectacle displayed on the towers at night. The day after, we left to reach Moissac and it marvelous abbey, especially known for its sculpted cloister and portal. All the columns in the cloister are sculpted with biblical scenes and it is worth to take a guided tour to understand these sculptures. We then left to Laressingle and its old bridge, La Romieu and its lovely church and Agen with the Saint Caprais Cathedral. The next day was especially marked by the visit in Rocamadour which is really one of the most beautiful places on the way. It is worth lose yourself between the streets, passages and buildings and climb to the summit to enjoy the view. We then went to Le Buisson de Cadouin with its beautiful abbey/cloister and to Saint Avit Sénieur with its nice church. We finished the day camping in Perigueux. We left Perigueux the following day after a visit to the nice Cathedral with its particular byzantine shape. The town centre is quite nice. On the way back to Lyon, we stopped in Sarlat, a medieval treasure currently on the tentative list, and later in Clermont-Ferrand to visit Notre Dame du Port church. This was the end of our small trip throughout some of the marvels on the way to Santiago. Apart from these, we went later (on our way to Reims) to the Cathedral in Châlon en Champagne and to the Basilica in L’Epine. This latter one is a beautiful example of flamboyant Gothic. In fall 2014, I visited, with my grand parents, the Basilique Saint-Eutrope in Saintes (the city is also notable for its rich Roman heritage), the abbey in Saint-Jean-d'Angély, the pilgrims hospital in Pons (very nice medieval village), the Saint Peter church in Aulnay, the Saint-Hilaire church in Melle and the Saint-Hilaire-le-Grand church in Poitiers. The churches in Melle and Aulnay are real Romanesque treasures and possess beautiful and fine sculptures. 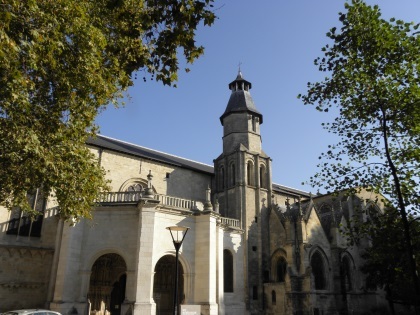 The city of Poitiers possesses a great heritage in the historic centre that fully deserves to be seen, especially the cathedral and the paleo-christian baptistery. In addition, I have visited the Saint-Honorat church in Arles, located in the very nice Alycamps roman and medieval cemetery, part of the WHS of Arles in 2014. I have also visited some of the churches in Bordeaux during my visit of the town in Spring 2015. So far I have seen 41 of the monuments gathered in this WHS. It will soon increase. We visited the sites of the first sections of the Via Tolosana and the Via Podiensis on our trip through southern France in June 2013; a total of sixteen sites: nine churches and monasteries, five bridges and two former Hôtel-Dieu. The highlights were the cloister of the Abbey of Saint-Pierre at Moissac (photo) and the decorated portal of the monastery church of Ste-Foy in Conques. 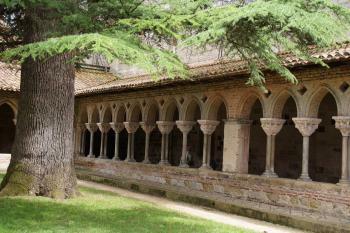 The cloister at Moissac is impressive not only by its size, but mainly by the rich decoration. The capitals of the many columns depict characters and scenes from the Old and New Testament and from the live of the saints. The Church of Sainte-Foy at Conques was a real surprise. The church itself is rather plain, but the tympanum of the portal is marvellous. The reliefs show the Last Judgement, Heaven and Hell with more than 100 figures. It is exceptional because of its size, the abundance of details and its surprisingly good state of preservation. In the centre is the figure of Christ in a mandorla, at his right a depiction of the paradise and saints and martyrs, and at his left - much more fanciful - the "devil's world" of hell and perdition with demons and ghastly figures. My favourite scene shows a sinner thrown head first in the jaws of hell. You should also make a detour to the viewing point south of the village, it offers a wonderful view of the abbey and the medieval village (a small road branches off the D901, about 1 km south of Conques). 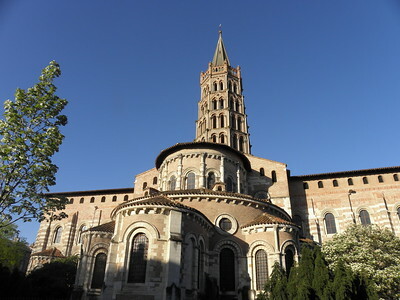 Also worth a visit: Abbey Saint-Gilles near Arles with a rich decorated façade and three portals; Saint-Sernin at Toulouse; Notre-Dame-du-Bourg in Rabastens with colourful murals; the Cathedral in Le-Puy-en-Velay, the city has a scenic location between basalt mounds (puys) and is also known for a delicious sort of green lenses. Saint-Guilhem-le-Désert was rather disappointing though the village is nice. The abbey is a tourist attraction with a large parking lot and many souvenir shops. But worth a stopover: the nearby Pont du Diable, also part of the WHS. The inclusion of these sites in the itinerary of our three week trip led to a kind of overkill of sacred sites. Of course, to travel by car is not the best way to visit a pilgrimage route. On the other hand, the French route is not a continuous linear landscape, but a serial nomination consisting of 69 single monuments. Apart from these, there are seven stretches (between 17 and 35 km) whose course has been identified as unchanged since the Middle Ages. We hiked only a short section of one of these stretches between Saint-Côme-d'Olt and Espalion (about 7 km), of course far to little to feel like a pilgrim. You can find churches and cathedrals in this WHS, but, if you can, you have to stay in Conques or Rocamadour overnight, both places will make you feel like you were a medieval pilgrim. St-Jean-pied-de-port is also a charming town, last stop before crossing the Pyrenees. I've also been to: St-Sernin (Toulouse), St-Guilhem-le-Désert, St-Bertrand-de-Comminges, L'Hôpital-St-Blaise, Périgueux, Bayonne, Bordeaux, La Sauve, St-Gilles, the superbe Arles, Cahors, St-Lizier, Valcabrère, Figeac, Gavarnie (worth a day at the cirque), Rabastens, Amiens, Poitiers, Melle, Saintes, and the stunning Mt-St-Michel. I visited several sites listed in this WHS : in Paris, Amiens, Arles, Mont-St-Michel, etc. Still I feel that it would make much more sense to only have the Cathedral of Santiago de Compostela only as a WHS and not the whole route. I don't have a problem with the French and Spanish routes being kept separate, I travelled them separately. But what bothers me is the amount of duplication; sites that are on the Route of St James of Compostela as well as being listed separately. Paris (Tour de St Jaques), Arles (Alyscamps), Vezelay church, Mont St Michel, Bordeaux (churches of St Seurin and St Michel, and St Andre cathedral), Bourges cathedral and Amiens cathedral. Moissac - abbey and cloister (interior decor looked like wallpaper, but was hand painted in the 1960s). Figeac - Hospital St Jacques, still part of the town's hospital (a scenic bus route links Figeac and Cahors through the Lot valley). Cahors - cathedral with stunning stained glass, and Valentre bridge. Comminges - St Bertrand's cathedral with wood carvings and huge organ (walk from Valcabrere then climb 142 steps). Bayonne - cathedral with English and French royal coats of arms. Perigueux - St Front cathedral, Byzantine appearance with domed roofs. Le Puy en Velay - cathedral and Hotel Dieu, on the side of a hill, with many levels and decorative brickwork. Chalons en Champagne - Notre Dame en Vaux church, significant stained glass windows including St Jacques defeating the Moors at Clavijo. I actually never planned to visit this WHS although it consists of so many sites that it is hard to miss on a trip to France. Last July, I saw the Saint-Jacques Tower (fortunately without the scaffolding described by Ian) on my first full day in Paris and I later visited the huge Amiens Cathedral (also a WHS in its own right). Unfortunately, I was not able to visit the Alyscamps cemetery while in Arles due to time constraints, but I have seen photos and it looks quite interesting. The historic and religious importance of the Routes of Santiago de Compostela, whether in Spain, France, or beyond, is obvious - what is unique to the French site is that it includes several component sites that are inscribed on their own merits as well. Of the sites I have visited, these include the Cathedrals of Amiens and Bourges, as well as Mont St. Michel and the Alyscamps necropolis in Arles. Vézelay would also be on this list. 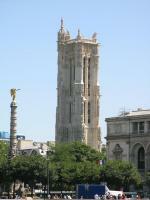 I also visited the Gothic-style Tower of St.Jacques in central Paris, next to the Louvre on the rue de Rivoli. It is actually the only remaining part of the former church of St. Jacques de la Boucherie, a popular stop for pilgrims on the Way of St. James. It is set in a pleasant park right in the heart of Paris and was for many years renovated and covered by scaffolding. A nice sight, but nothing extraordinary. Many tourists have probably wandered by already and ignored it, but for WH collectors it is an easy pick. On a separate trip, I have visited the Church of St. Hilaire le Grand in Poitiers (close to the centre), as well as the 3 listed churches in Bordeaux (the massive Cathedral of St. André, and the basilicas of St. Michel and St. Seurin). On yet another trip, I saw the 2 inscribed buildings in Toulouse - the Basilica of St-Sernin (very impressive, apparently the largest remainig Romanesque building in Europe) and the Hôtel-Dieu Saint-Jacques, a unique example of a medieval pilgrim's hospital that was in use as a hospital until the 1980s and today features a small medical history museum. Reading this site's description is like reading a gazetteer of French towns and villages west of the Paris/Rhone axis – it contains 69 different locations (out of 800 possible ones linked to the pilgrimage route). But think what it would have been like if France had followed the approach of Spain for its “Route” and inscribed its entirety together with 30 metres either side! Instead the “locations” are usually 1 building per town and cover the 4 starting points at Paris, Vezelay, Le Puy and Arles together with places as varied as Mont-Saint-Michel and Bordeaux. 10 cathedrals are included, together with abbeys, churches and hospices. 7 of the locations are already inscribed in their own right, usually because of their role in the pilgrimage route – a nice bit of double counting! However, as Els’s “themes” section shows, Christian sites are heavily over-represented in the WHS list and this site should surely have been combined with the 2 Spanish Compestela route sites and some of the separate French pilgrimage route sites such as Vezalay and Bourges as well !. All this duplication does seem “overkill”- If the UK can agree to “give up” Hadrian’s Wall and subsume it with a German site under a combined “Frontiers of Rome” how come France was given a separate inscription for this site in 1998? The Pilgrimage route to Santiago de Compestela plays a large role in European history and as such is very justified in being inscribed on the WH list however I would like to support what Paul Tanner has said below about the viability of this site, it is an inscription that would make much more sense if it was to be combined into a much larger single site containing all the routes in the many Western European countries, the separate inscriptions suggest the route is a manifestly different entity in France than it is in Spain (or in the other countries) which seems to run against the importance of the route. The Council of Europe made the route to Santiago its first cultural route and this recognition makes much more sense when it is not broken up into separate national entities. I visited Arles, which is one of the starting points of the four main routes in France, and I can strongly recommend a visit out les Alyschamps to see the Church of St Honorat, it is also a very interesting WHS site in itself. I visited Mt St Michel in 2006 and there is are a few Scallop shells around the town (picture), keep an eye out for the nice hand basin just inside the main gate. About 15 years ago I visited the charming town of Rocamadour, as mentioned below, it was a lovely place, with a great Eagle sanctuary and prehistoric cave (frustratingly not part of the very nearby WHS of the Decorated Grottoes of the Vézére Valley) I am pretty certain I visited the inscribed church, but as I was so young I am not counting that one. I have also visited some parts of the route in Belgium, Switzerland and a few random churches on minor routes in France. I visited the Cathedral at Chatres, but despite it being on the route and it displaying the scallop shell to signify its welcome to pilgrims, it is not part of this WHS inscription. I am still trying to work out why some sites are included and others aren’t. In Paris I visited Tour Saint-Jacques-de-la-Boucherie, which is opposite Hotel de Ville. This was the meeting point for all pilgrims setting off from Paris. I first saw it in Feb 2006 and there was scaffolding around it I went back in Sep 2006 and hoped to get a better look, however it was now shrink wrapped and unfortunately will be so for the next 3-4 years as a major restoration is taking place. One plus point is that you can look into the courtyard to see the sculpting of the replacement sculptures; it is a small consolidation to see conservation in action! Knights Hospitaller: "Aragnouet: Hospice du Plan and Chapel of Notre-Dame-del'Assomption, known as the Chapel of the Templars". Taken over by the Knights Hospitaller after disbanding of Knights Templar. Knights Templar : "Aragnouet: Hospice du Plan and Chapel of Notre-Dame-del?Assomption, known as the Chapel of the Templars". Taken over by the Hospitallers after disbanding of KT. Scientific Developments: Tour St Jacques in Paris was where Pascal carried out experiments on atmospheric pressure and there is still a meteorological laboratory installed at the top of the tower. John D Rockefeller Jr: The Cloisters Museum of New York (now part of Met Museum of Art) was created by Rockefeller between 1935-9 with close personal involvement as a result of his interest in mediaeval art and contains reconstructed cloisters which were originally part of 5 religious buildings in France and had been collected by a sculptor friend of Rockefeller. One of these, The Abbey of St Guilhem-le-Desert is inscribed as part of the Routes of Santiago de Compostela in France. Built in the 11th century: From the 11th-13th centuries 'staging post' churches developed along the pilgrimage route, and in particular in France. Recommended for combination by AB: "It hopes, however, that the two States Parties concerned (France and Spain) will give serious consideration to combining their respective stretches of the Route in a single inscription, comparable with the joint Franco-Spanish inscription of the cultural landscape of Pyrénées-Mount Perdu in 1997."